When you are in need of some sandblasting for your warehouse or on some of your equipment, we can do the job for you. We will work quickly and relatively clean, so you don’t lose out too much time on your productivity. We also offer various abrasive blasting methods that will not get in the way and cause dust clouds that will stop your work. So look for us to get what you need to give new life into your equipment or workspace today. Our professional staff is here for you to make sure that your job always stays running and always looks great. 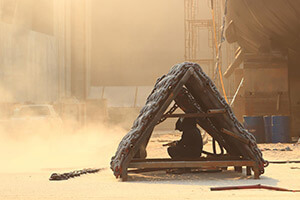 At the most basic we can offer to you what is known as sandblasting or sometimes called abrasive blasting. This is accomplished by having a medium blasted through a high-pressure nozzle using a pressurized fluid. This fluid actually usually is compressed air. Often the medium being metal or sand hence the name sandblasting. It is a time test process that has been around since the 1800s and is a simple but great way at paint removal or rust removal. Thanks in part to the flexibility of sandblasting we can do many jobs for you, and if this method does not seem right for what you need then we do offer other types of abrasive blasting. While sandblasting is a great fast and easy way for paint or rust removal we do offer other forms of abrasive blasting. We can also do dustless blasting that uses crushed glass and water to allow no dust from paint or rust particles and great to use while working in conjunction with our team. As well if you have some area that need a lighter tough, we offer soda blasting that uses sodium bicarbonate at a lower pressure. It won't damage fragile areas and best of all is excellent at cleaning and removing odors from mold and fire or smoke damage. Because of the flexibility of the various methods that we have on offer we can handle any job you throw at us. Size is no issues as well when dealing with abrasive blasting. We can handle an industrial load of work. You will not find a better suited sandblasting company around in the Dallas Texas area that can handle all of your sandblasting needs. We are the experts that know how to handle industrial jobs and our years of experienced have thought us all the ins and out of managing the job. So let us blast away the old and worn to prepare you for the new today. You are a professional that only gives your customers the absolute the best. That is why when you hire someone you expect the very same. We will more than meet your requirements for a job well done. We can handle any industrial sized job in any condition. We can work with you, so you don’t have to delay your productivity as we offer other options such as dustless blasting to make sure you always stay on task.